Everyone knows a Feiffer illustration when they see one: His characters leap across the page, each line belying humor and psychological insight. 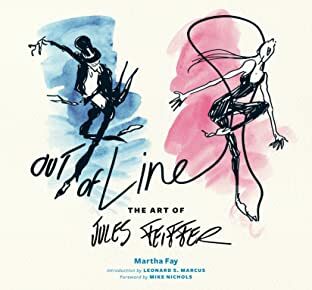 Over Feiffer's prolific 70-year career, his nimble and singular imagination has given us new perspectives as well as biting satires on politics, love, marriage, and religion-alternating with stories imbued with the playful anarchy of a child. Feiffer's varied output includes children's books (The Phantom Tollbooth and Bark, George), plays (Little Murders), movies (Carnal Knowledge and Popeye), and comic strips (most notably in his Pulitzer Prize-winning Village Voice comic strip of 42 years). 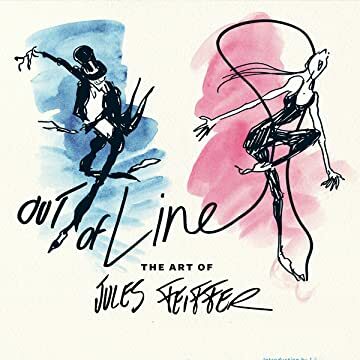 Out of Line: The Art of Jules Feiffer is the long-awaited illustrated retrospective of Feiffer's celebrated career, providing a revealing glimpse into his creative process and his role as America's foremost Renaissance man of the arts.